Come this time of year when the weather is warmer and the sun seems content on teasing you from behind your poorly air-conned office window, we all face the annual struggle of trying to decide which way to blow our summer budget and make the most of our rare time off: do you splash out and go on that holiday that your mates have been badgering you about for months now (#ladsinkavos)? Or, do you opt for a stay-cation and splurge your earnings on that music festival with the epic line up of stars you have been dying to see (don’t worry, we won’t tell anyone you’ve never actually heard of half the people in its line up). Well, this year you don’t have to face that all-consuming decision (in which you inevitably make the wrong choice), as Soundwave- the Croatian party event that manages to blur the lines between holiday and festival- is back for its ninth summer, offering you the chance to reap the best of both worlds: have fun in the sun and allow Soundwave to provide the unique soundtrack to your unforgettable holiday. So, grab your mates and your passport (and your armbands if necessary) and get ready for the trip of a lifetime. The selection of talent on offer at Soundwave this year has lead its organisers to describe it as the festivals “most ambitious and inspired line up” to date, featuring legendary artists, genre-leading bands, of-the-moment DJs and the best in up and coming talent, blending in to a musical cocktail with hints of hip hop, reggae, jazz, afro, house, soul, drum & bass and much more (which, FYI, makes the perfect concoction). Scattered across the festival’s three stages like stars in the Croatian sky are big names like legendary alternative hip hop group The Pharcyde, the man known as the Godfather of neo-soul and the prophet of acid jazz Roy Ayres, Phenomenal Woman and gifted soulstress Laura Mvula, as well as the likes of iconic DJ and all-round music enthusiast Gilles Peterson, acoustic electronica trio GoGo Penguin and none other than record producer and DJ meets drum and bass legend Roni Size. And this is just a sample of the scene-defining array of talent on offer at Soundwave, so if you’re a long-time fan of the artists appearing or you want to pay homage to Soundwave’s commitment to exploring the unexpected and find yourself a new idol, it’s pretty clear that when it comes to music, Soundwave is the only place to be. As if the incredible line up of artists, musicians and DJs wasn’t enough, Soundwave have really pulled out all the stops this year to ensure the party never ends and the fun keeps on going by organising boat parties and after parties to keep revellers on their ever-dancing toes. These festivities, fit for party-goers and personage alike, bring the best of Soundwave into a microcosmic version of events, providing a more intimate but just as explosive experience. The array of genre-specific boat parties taking place over the long weekend on the festival’s very own legendary ship, The Agronaughty, is undeniably impressive: with genres from reggae and funk & soul to disco and hip hop, there really is something to float everyone’s boat, so climb aboard (pun obviously intended). Alternatively (or, let’s face it, as well as!) Soundwave after parties run on Friday and Saturday night (or morning should I say) from midnight to 6am at the festival’s open-air club, Barbarella’s, for those who just aren’t ready to call it a night yet. Whatever you decide to do and however you decide to do it, if one thing is for certain it’s that Soundwave is a party like no other. Being a music festival, there’s no denying that the musical array on offer at Soundwave is quite possibly the highlight of the festival. However, with this being said, the festival also presents some unmissable experiences and activities for revellers to enjoy. Once again, after highly successful appearances last year, Soundwave will be commissioning some of their favourite European illustrators and street artists to transform The Garden Resort, adding to the beauty already provided by the surrounding nature and making it all the more visually enchanting. Alternatively, if you need a few hours to kick back and relax, why not make a pit stop at the open-air cinema which, also returning after enjoying huge success last year, will be showing a range of independent and Croatian films. 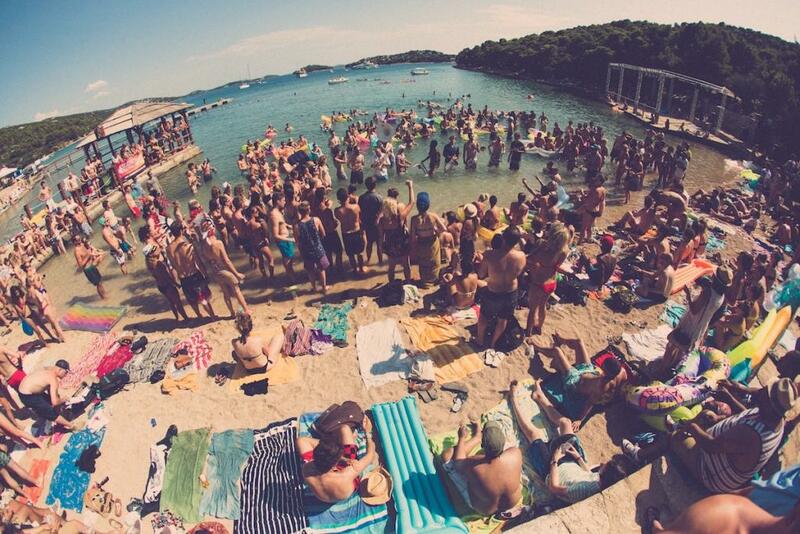 Throughout the five-day festival, Soundwave may feel like the centre of the universe, but you’d be a fool not to make the most of the stunning scenery that Croatia has to offer surrounding the festival. Party-goers can (and should) take full advantage of the activities at hand in local areas, like fishing, diving and snorkelling. Or, go a step further and hire a boat to visit nearby national parks like Kornati and Krka, whose stunning natural beauty is unmatched by any other festival backdrop. The electric vibe that is unique to Soundwave Festival will probably have you feeling invincible, but it may be a good idea to think about catching forty winks at some stage during the week, and to do that you will of course need a place to stay. The good thing is that at Soundwave you are spoilt for choice, with onsite and off-site accommodation options available. Stay at the centre of the party and opt for onsite accommodation in either the rentable apartments or campsite/glamping ground, or have a more peaceful night’s sleep in one of the many off-site rental apartments. Alternatively, if you have good sea legs, be adventurous and charter a boat that can be docked in Tisno Bay, just a short swim from the festival shores (though please find alternative route back if you are a little worse for wear come the end of the day- no judgement here). As you can see, Soundwave is the perfect compromise for those who can’t decide between festival and holiday: the idyllic scenery and gorgeous weather paired with the eclectic music and activities on offer make it a truly unmissable amalgamation of the two. Soundwave Festival takes place between 27th-31st July at The Garden Resort, Croatia, and tickets are selling fast, so to get your holiday and festival fix all at once, don’t delay in heading to http://www.seetickets.com/even t/soundwave-croatia-2017/garde n-festival-site-the-garden-tis no/1027606#website where you can currently benefit from 5 tickets for the price of 4. See you at Soundwave!